Click below to learn more about Tsubaki’s Backstop Cam Clutch! Issue: RS120 competitor’s chain was supplied in strands of four (4) at 137 feet each. The primary issue of this metal processing application was elongation due to lack of lubrication throwing the looper cart out of alignment. Tsubaki Solution: Tsubaki’s technical support team further investigated the issue – the application required a chain that lubricates itself whilst being able to handle static hanging load simultaneously. 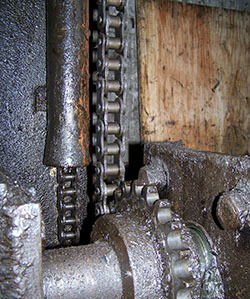 We recommended having the first 2 feet and the last 2 feet of each strand to be Lambda self-lubricating chain – this was recommended as these were the areas of the chain that were engaged with the sprocket; for the middle area we recommended RS120 Heavy – to withstand the static hanging load. These four (4) strands were matched and tagged to assure that the chain travels and wears evenly. This “hybrid” chain not only resolved the lubrication issue as well as uneven stretching but also improved the chain life ultimately. Cost Savings: Ultimately, the customer paid three folds than what they paid for the competitor’s chain, however, Tsubaki’s innovation with the “hybrid” chain increased the life by almost six folds and saved this customer a total of $126,189. When chains have to run in parallel for conveying purposes it is very important that chains travel and wear evenly otherwise it will throw the application out of alignment producing flawed and defective output. In this case it is critical to have the chains ordered as a set. Generally, if the conveyor chains are made in the same lot, the relative differences inlength will vary only slightly. Tsubaki is able to supply chains with specific length tolerance, or even pairs and multiple chains length matched andtagged in the same way for easy identification and installation. Tsubaki chain length tolerances are very narrow by nature; Tsubaki chain coming from the same production lot will comply with these tolerances as a standard. The figure below shows the amount of variation for several types of chain chosen at random from the same production lot.